The event, process, or outcome departs from the expectations of the observing community or those affected by the event or process. Seen from this point of view, surprise abou t one or another aspect of climate change is an after-the-fact reaction to an observation or new scientific finding that, in some sense, lies outside our range of expectations. A reduction in ‘conveyor belt’ oceanic overturning leading to cooling at high latitudes occurs, despite general (but slower) global warming. 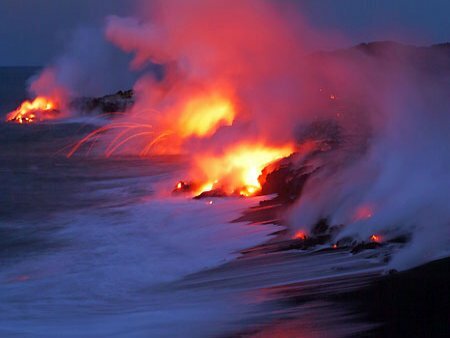 Heat stored in the ocean at intermediate depths is released to the atmosphere, leading to rapid warming. Dimethyl sulfide emissions decline with reduced sea ice, causing cloud brightness to decrease and warming to accelerate. Dimethyl sulfide emissions change with sea-surface temperature change. Synergism of habitat fragmentation, artificial chemicals, introduction of exotic species and anthropogenic climate change affect ecosystems in unforeseen ways that reduce biodiversity. Geo-engineering is practised intermittently by only a few nations causing international political conflicts and greater environmental instability. Don’t say you weren’t warned…. The Cold War divided the people of Europe for nearly half a century, and it turns out humans weren’t the only ones stuck behind the Iron Curtain. Trade blockades led to vastly different numbers and types of invasive birds in Western and Eastern Europe, new research reveals. The findings, say experts, highlight the dramatic impact human activity can have on the success of alien species. The way the Cold War carved up the globe also impacted the type of birds that were introduced. There was a rise in North American bird species, such as the ruddy duck, intentionally introduced to Western Europe many times between 1945 and 1989, but not much of a rise in the East. At the same time, people from former French and British colonies immigrated to Western Europe, toting along 23 African bird species. “They brought their caged pet birds with them–if not physically, then they brought the demand,” Shirley says. While connections between Western Europe, the Americas, and Africa boomed, trade across the Iron Curtain withered: Exports from Western Europe to the East represented less than 5% of Western European’s total trade volume. The few invasive species that established themselves in Eastern Europe during the Cold War tended to come from other parts of Eastern Europe, or from Asia. Since the Cold War ended in 1991, the pace of bird introduction events has picked up. Looking at records from 1989 to 2000, the study’s authors found more than 600 instances of alien species released into the wild in Eastern and Western Europe, versus almost 900 for the roughly 40 years of the Cold War. Trade and movement across the former Iron Curtain and rising prosperity in Eastern Europe has made the problem of invasive species worse, they say. “It’s speeding up exponentially, not just for birds but for many other groups, like plants, mammals, insects and fish,” says team leader Francois Chiron, a researcher at the Hebrew University of Jerusalem when this research was conducted. A new paper in the Journal of Applied Ecology (Bergstrom et al (2009). 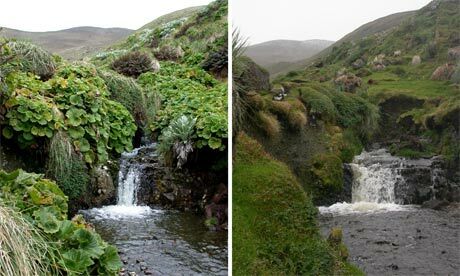 Indirect effects of invasive species removal devastate World Heritage Island, doi: 10.1111/j.1365-2664.2008.01601.x) describes how, on Macquarie Island, an important breeding location for several species of penguin, the elimination of invasive cats in attempt to protect the penguins has triggered a trophic cascade as herbivore populations have boomed defoliating the island. The study’s lead author Dana Bergstrom, of the Australian Antarctic Division, estimates that nearly 40% has been modified, with 20% having moderate to severe change, and that rabbits have convert vegetation from complex communities to short, grazed lawns or bare ground. Things began to go wrong on Macquarie Island, halfway between Australia and Antarctica, soon after it was discovered in 1810. The island’s fur seals, elephant seals and penguins were killed for fur and blubber, but it was the rats and mice that jumped from the sealing ships that started the problem. Cats were quickly introduced to keep the rodents from precious food stores. Rabbits followed some 60 years later, as part of a tradition to leave the animals on islands to give shipwrecked sailors something to eat. Given easy prey, cats feasted on the hapless rabbits and feline numbers quickly grew. 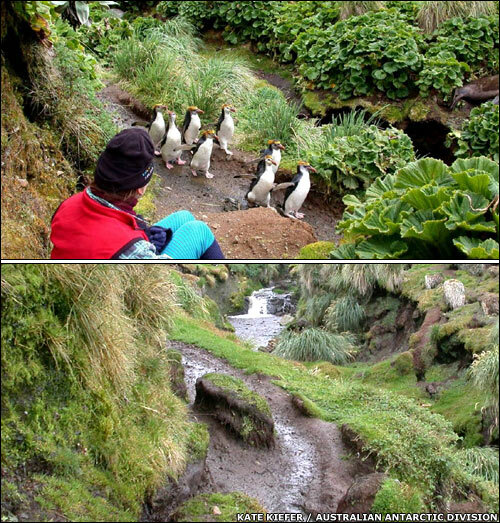 The island then lost two endemic flightless birds, a rail and a parakeet. Meanwhile, the rabbits bred rapidly and nibbled the island’s precious vegetation. By the 1970s, some 130,000 rabbits were causing so much damage that the notorious disease myxomatosis was the latest foreign body introduced to Macquarie, which took the rabbit population down to under 20,000 within a decade. “The island’s vegetation then began to recover,” Bergstrom says. But what was good for the vegetation proved bad for the island’s wildlife. With fewer rabbits around, the established cats turned instead to local burrowing birds. By 1985, conservationists deemed it necessary to shoot the cats. The last cat was killed in 2000, but the conservationists were horrified to see rabbit populations soar. Myxomatosis failed to keep numbers down, and the newly strong rabbit population quickly reversed decades of vegetation recovery. In 2006, the resurgent rabbits were even blamed for a massive landslip that wiped out much of an important penguin colony. The Tasmanian Parks and Wildlife Service intends to fix the island once and for all, and has drawn up plans to eradicate all 130,000 rabbits, along with the estimated 36,000 rats and 103,000 mice that live there. According to the “tens rule”, roughly ten percent of introduced species become established and ten percent of those become invasive. Only it doesn’t hold for mammals or birds, according to Jonathan Jeschke’s study, the findings of which are published in Diversity and Distributions. The Ludwig-Maximilians-University, Munich, researcher found that fifty percent of introduced bird species become established, of which 34 percent become invasive. Mammals are even more successful colonists, with an amazing 79 percent finding a permanent home and 63 percent of those going on to become a pain in the proverbial for conservationists. That makes mammals almost fifty times more effective invaders than the tens rule predicts. How wrong can one be? I wonder what explains this difference between mammals and birds. Is it something to do with biology or what species people move around? It would be interesting to see how the patterns vary with body mass. Another paper by Jeschke is also interesting. Invasion success of vertebrates in Europe and North America – which showed that there does not seem to be ecological imperialism between vertabrates, and that invasion success is higher than expect.